Who is The Solution Guru? “Better is a little with righteousness than great revenues without right. 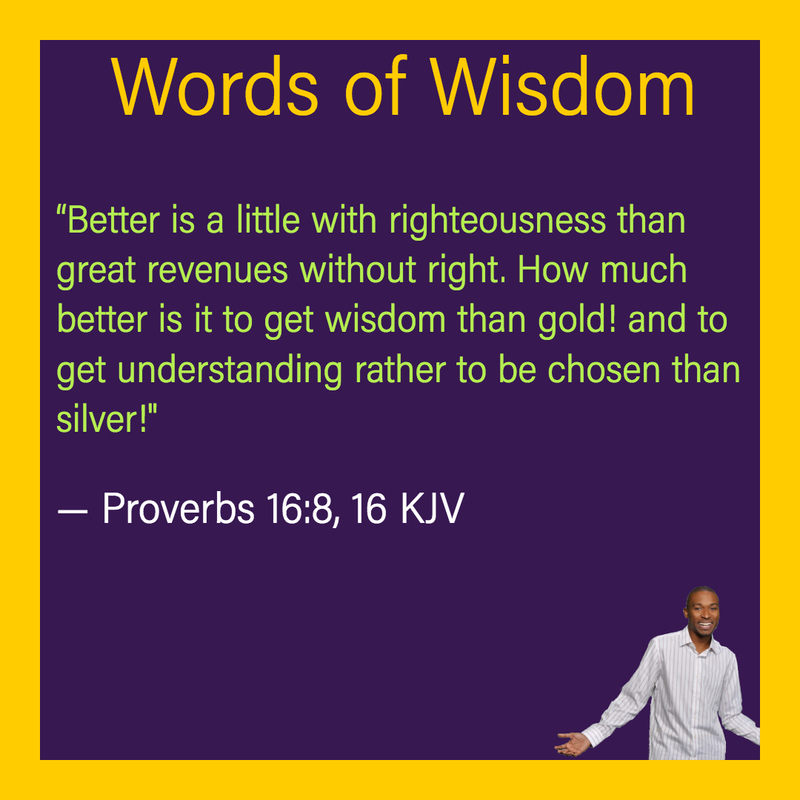 How much better is it to get wisdom than gold! and to get understanding rather be chosen than silver! "As humans, we all seek more in life...In America, we're taught the American Dream...Beautiful House, Car, Bike, Boat and Retirement. In the pursuit of the American Dream, we get caught up on seeking "great revenues" to build this dream. The problem is too many people lie, cheat and steal their way to this dream. They don't realize their future results is a great misfortune. "Better is Little with righteousness" meaning it's better to create your lifestyle the right way by helping people achieve their goals as you achieve yours. We're so busy in the pursuit of success, we forget to be wise in all our choices. It's better to have a little house and car you've worked hard for, then a mansion you stole for! "How much better is it to get wisdom than gold" Wisdom comes from listening and was founded on righteousness! Many times we've sought our dreams, without wisdom. It's the reason why during the attempt to achieve goals we fail. Wisdom comes from season advice...Remember that time, someone told you to do something but you did the opposite and the results were bad! Wisdom was talking, but you weren't listening. "Get understanding rather than chosen than silver" People don't listen to each other because they don't "understand" each other. It's sad but most people don't listen to themselves or seek understanding of life. What's your purpose? What's your destiny? Who are you? What will you become? Please understand the point of this series is for you to apply the principles from your spiritual foundation. These are lessons I've learned and is my interpretation of my spiritual foundation. I challenge you to interpret your own! "Life, Times, and Thoughts of Shawn Ryan Randleman"! It's just my thoughts Ladies and Gentleman, just what I'm feeling at the time on life and the world. Hopefully you gain Knowledge, Understanding and Wisdom from my blog. All Content Rights Reserved 2002-2018. SMART In Concepts® Solution Guru™ by Randleman Holding. Awesome Inc. theme. Powered by Blogger.